When you usually think of certificates, you think of a piece of document that is formal, well designed and official in nature. But a certificate need not always be so formal or sombre! It could be something quirky and funny as well! For instance, why don’t you take a look at these funny sports certificates provided below? Not only do they serve the purpose, they also bring a smile to your face. And that is a must when it comes to Certificates. The template comes with a background that appears to have been engraved. With a design that is simple and minimalist, you really cannot afford to miss out on this one. The border in this funny sports certificate is the first thing you notice. It is fun, quirky and playful. Also, the certificate template is simple and well organised. 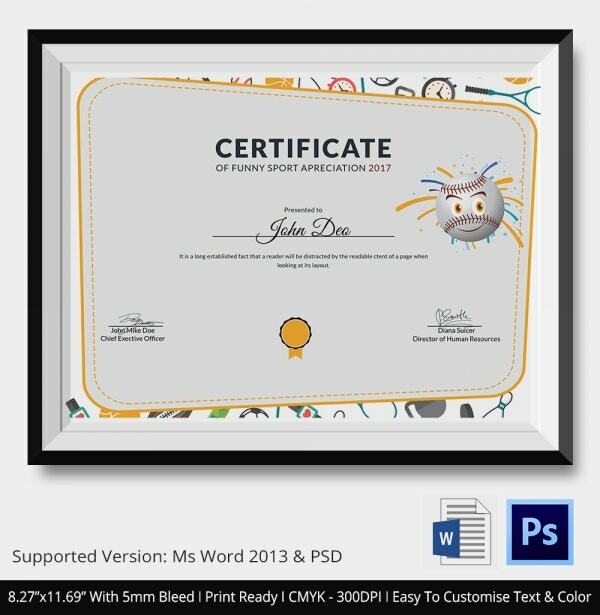 This funny sports achievement certificate template comes in a standard size and with Word and PSD compatibility. Also, the template is very easy to use and customise. 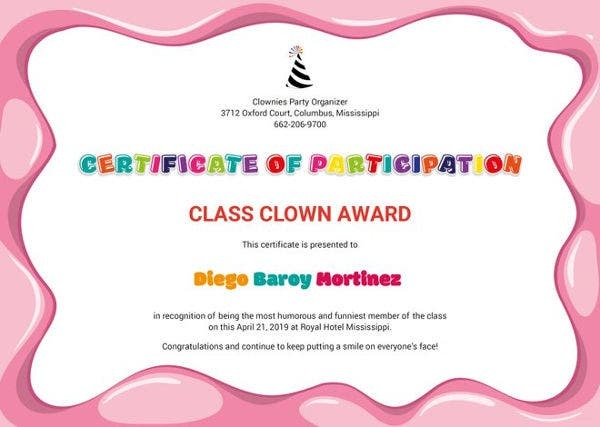 Since this certificate template comes with images of soccer balls, it would probably be perfect for a related event. Also, the certificate template is fully customisable and editable. This participation sports certificate template would be perfect for a kids’ sports event. Also, the template comes with a fairly high resolution of 300 dpi and adjustable text and color. > What do the Funny Sports Certificates Contain? A sports certificate contains all that an ordinary certificate would contain. However, it is much more specialized and specific in nature. The certificate would state the purpose at the very beginning – whether it is a mere certificate of participation or a certificate of excellence. Next, you have the name of the person who is being awarded the certificate, in bold and well defined terms. A border in such a certificate is must. 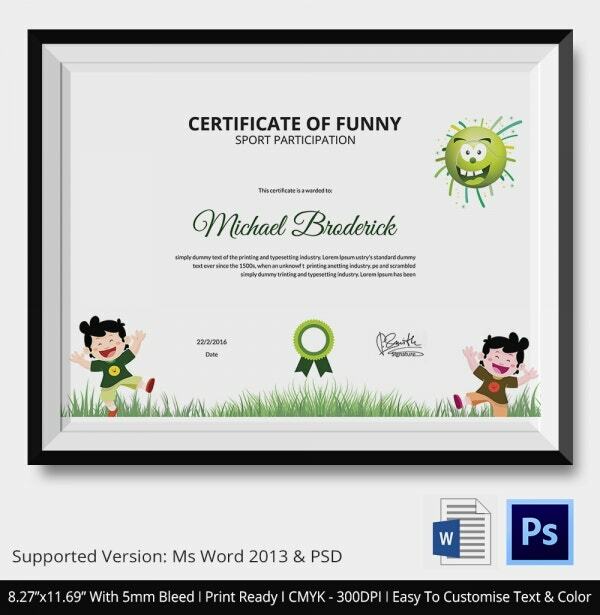 In these funny certificate templates, you also have certain animations or other designs which make the template look attractive. These add a certain quirky charm to them as well. 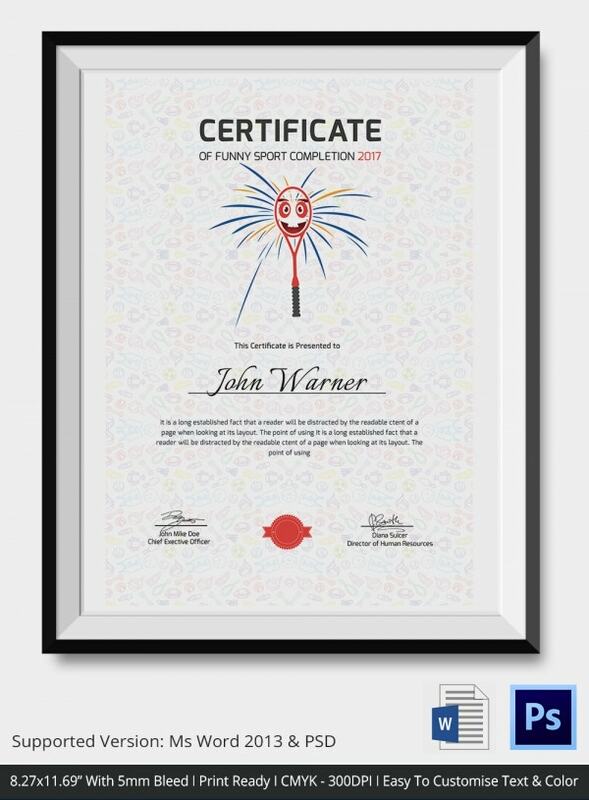 > Why should you use the Funny Sports Certificates? 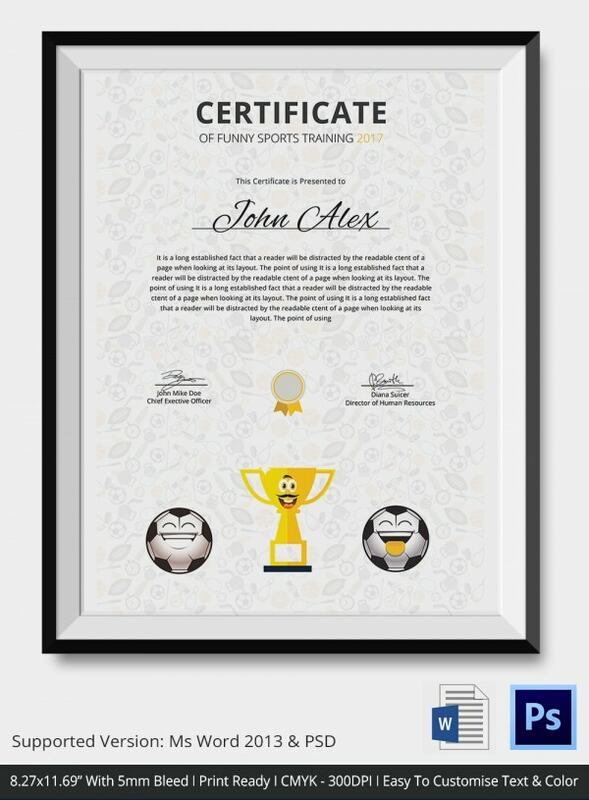 The sports certificates you see here come in a format that is ready to print. That means, once you download it, you can start printing your certificates if you are satisfied with the overall appearance. The templates are extremely easy to use. If you’re worried that you might find it challenging, then you’re mistaken. As long as you know how to operate word, you should be able to easily use the templates. Also, they come in a Word or PSD format. 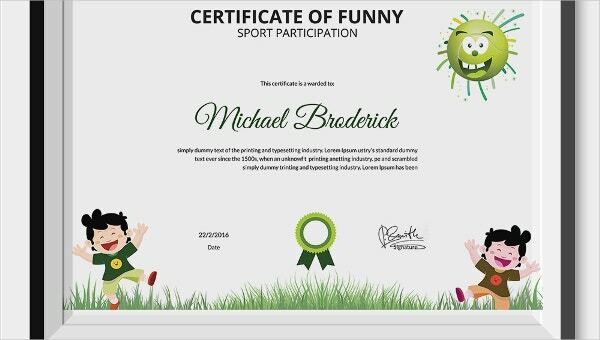 The funny sports certificates that you see here would be perfect for any light hearted sports event. One can download the template and simply rest assured, because most of the work has already been done for you. All you have to do is go through the details, edit a few and then print it.